Capsule Summary: Another full, rich day at the 4077th: Father Mulcahy comes down with hepatitis, Hawkeye has severe back pain, and B.J. tries to perform a complex surgery with only the help of a textbook. Although a low-key episode, “Hepatitis” is nevertheless a solid one. Colonel Potter springs into action after Father Mulcahy is diagnosed with hepatitis in the Mess Tent. He orders B.J. to give Mulcahy a blood test; tells Hawkeye to examine the staff and give everyone gamma globulin shots; sends Radar to inspect the water supply; and tasks himself with talking to the cook. We don’t see B.J, Radar, or Colonel Potter doing their part to handle the potential hepatitis outbreak. The bulk of the episode consists of Hawkeye giving people their shots while also listening and offering advice. He gives Frank, Margaret, Klinger, and Radar shots; his talks with Frank and Klinger are silly; those with Margaret and Radar are serious. I think a lot of fans like Hawkeye’s chat with Radar but I don’t. I’ve never liked the astonishingly innocent and exceedingly naive Radar. The point of the talk, that Radar doesn’t have to feel bad about not wanting to booze it up like so many other soldiers, is perfectly fine. It’s just too mushy for me. Hawkeye also drops by Father Mulcahy’s and learns that Mulcahy is concerned about carrying out his priestly duties while under isolation. “People are depending on me,” he explains, before suggesting he take confession through a flap in his tent. In real life, if a MASH unit’s priest was sick, would the military have sent a temporary replacement to handle religious duties and administer the last rites? Aside from the hepatitis, there are two other storylines: Hawkeye’s back pain and B.J.’s difficult surgery. The surgery goes well, despite B.J. having to follow instructions in a medical textbook, and he celebrates by getting drunk in the Officer’s Club. That’s where Hawkeye finds him and finally manages to give him a shot. Hawkeye’s back pain turns out to be psychosomatic. There’s nothing wrong with his back. Colonel Potter, after giving Hawkeye his own shot of gamma globulin, helps Hawkeye realize he’s angry about being stuck in Korea. He’s also frustrated because an average doctor back home is doing very for himself because he’s not stuck in Korea. “Listen, it’s too big a world to be in competition with everybody else,” Potter tells Hawkeye. “The only guy I have to get better than is who I am right now.” If only we could all stop comparing ourselves to people we think are more successful than us. William Christopher spent eight weeks recuperating from hepatitis while production on Season 5 was underway. 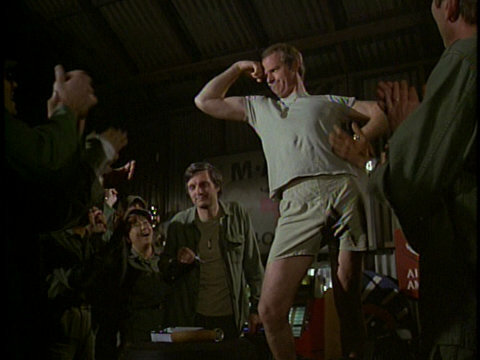 As he explained in The Complete Book of M*A*S*H, all exterior shots for the season were filmed early. He got sick while interiors were being filmed on the Stage 9 soundstage. Thus, despite being written out of interior scenes for many episodes, he still made appearances throughout the season thanks to the completed exterior shots. According to Gene Reynolds (also in The Complete Book of M*A*S*H), when William Christopher returned to work after recovering from hepatitis, his chair had been painted yellow. FRANK: Listen, while you’re here? Would you check my arms? I think my arms are getting longer. HAWKEYE: So take two bananas and call me in the morning. FRANK: Feel under my armpit! HAWKEYE: Not for five bucks. HAWKEYE: You’re certainly braver about this than my last patient. HAWKEYE: Frank. He was afraid his body was being attacked. MARGARET: He has very little to worry about. I find it such a coincidence that Frank was paranoid about feeling a lump under his armpit, and years later, Larry’s cancer was initially diagnosed because of a lump discovered at roughly the same spot. I thought there was no cure for hepatitis? At least not back then certainly. Maybe I’m wrong…? One joke I have never understood in this episode takes place when Potter is consoling Hawkeye in his office over scotch & fig newtons. Potter tells Hawkeye to write a nasty letter to his ‘incredibly average’ former colleague and threaten him with a malpractice or a paternity suit. Hawkeye then says “Doctor, Doctor, I can walk” and laughs. I just don’t get this joke. Is he quoting something with that line?